We’ve all got pretty used to sorting our own waste out into the right piles for recycling, but have you ever wondered what happens to it once you’ve put it out in the appropriate box, bag or bin? How does the council or the waste management firm go about getting it all sorted to send off for recycling – and what about places where there isn’t a kerbside collection, or convenient local recycling centre? What are the options for those areas where all the waste simply gets collected in a single, mixed batch? The answers – ranging from the highly technical, through to the surprisingly straightforward – may just surprise you. Welcome to the largely hidden world of waste sorting! Totting – also known as tatting or floor picking – is probably the simplest method of waste sorting imaginable. If you’re not familiar with the term, then the official description of “hand sorting with mechanical assistance” probably tells you all you need to know. Its principal use is in the separation of co-mingled waste – industry jargon for a collection which contains all the recyclable elements, but altogether. This is distinct from both source separated waste where all the glass, paper, plastic, metal and sometimes textiles are put out for collection individually by the householder and mixed municipal solid waste (MSW), which is any and every kind of old rubbish, dumped in a single bin. It ranges from operatives sorting through a mixed box of dry recyclables on the kerb outside of your house and putting them into different hoppers on their collection vehicle to using mechanical shovels and grabs back at the recycling centre to expose the items, and totters to pick them. It is a fairly simple approach, but one that seems to work very well, particularly once a totter is properly trained into what goes where – though there have been some accidents and even a few deaths when machinery and totter have collided. Going a bit more high-tech, material reclamation facilities – the acronym MRF often being pronounced as the single word “murf” – offer a less hands-on approach to sorting co-mingled waste. These are serious pieces of kit, needing sizeable buildings to house them and a good number of staff to keep them running smoothly. Their designs vary, but most types comprise a series of conveyor belts, chutes and hoppers, with differing levels of mechanical complexity being involved in the actual sorting process. In some of the simpler kinds of MRFs, there can still be a high degree of manual picking, but the more complex facilities minimise this element with the clever use of magnets, floatation tanks and cyclones to distinguish between the different kinds of waste travelling through. The idea of the “dirty murf” has been one of the enduring dreams of waste management – a machine that can take the entire contents of a bin just as it is, with recyclables all mixed in with everything else, and just sort everything out. Sadly, although there have been some partial successes over the years, the goal of a reliable and cost-effective mechanical solution for sorting out clean recyclables from mixed MSW collections simply hasn’t materialised. 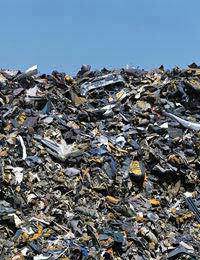 There are some so-called dirty MRFs working outside of Britain, but these aren’t required to handle the same kind of waste as in the UK – surprisingly perhaps, there’s a lot of variance in international waste – making it impossible to just import the technology wholesale. Never-the-less, the idea has been shown to have its place, particularly for sorting out many of the contaminants from green waste destined for composting, so all is not lost for the dirty MRF! Some truly amazing ideas have been tried to improve waste sorting over the years and while they’re not exactly what you might call rocket science, some of them do come pretty close. Microwave scanners – technology that NASA puts on its monitoring satellites – have been trailed to enhance polymer grading, some MRFs have dual-frequency x-rays to discriminate between materials and everything from Fourier Transform Infra-Red Spectroscopy (FTIR) to laser light has been tried to sort plastic. As our need to recycle increases and the variety of materials which can be recycled grows, new suggestions for high-tech solutions to help us sort our waste are bound to be around the corner. One thing’s for sure, the waste sorting world may be a hidden one – but it’s certainly never dull!